If you live in a booming metropolis like Atlanta, having a car at your disposal can be the difference between succeeding and getting lost in the crowd. Sitting in the 9th-largest metropolitan area in the whole country, Atlanta also works as the economic and creative capital for its surrounding areas. Getting approval for a bad credit auto loan can be extremely challenging. But, with patience and the right mentality, you should be able to find the right lender that ultimately benefits you in the long run. Instead of rushing into a car loan and having to settle for a mediocre vehicle, you need to sieve through all the offers you have available until you find a car that is perfect for you. You won’t have to worry about settling for bad terms either as CompleteAutoLoans.com helps you connect with lenders that provide fair terms to people with low or no credit history at all. Although purchasing a car may incur an array of additional fees, you won’t have to worry about paying anything extra when using our platform. At CompleteAutoLoans.com, our main goal is to help you get fair terms while allowing you to build a good credit history in the future. Because of this, our online application tool is available to all users for free, so you will not have to worry about covering additional costs even if you find a great deal. When taking out a car loan, the two most influential factors should always be the interest rates you are receiving and the total amount of the loan. As you may have imagined already, the total amount of the loan consists of the cost of the car plus all fees from both the dealership and the lender. Knowing this number will help guarantee that you can afford to pay back the loan in the stipulated amount of time. On the other hand, the interest rates are charged only by the lender, and they can vary depending on your credit history and your current income. People with the highest credit scores often get lower interest rates. Because of this, you may want to take time to work on your rating before applying. This can give you the possibility of saving up money for a down payment at the same time. Your credit score is the single most important factor when taking out any type of loan, even for used cars. If you don’t need a vehicle urgently, you can always work on improving your score for a few months before applying. If you also save money for a down payment, you are more likely to get approved and receive lower interest by paying off a large chunk right off the bat. 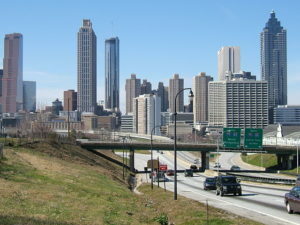 Atlanta is one of the most historic and culturally rich cities in the United States. Also know as The Gate City, or simply The A, this lively metropolis is the stronghold of the State of Georgia. It boasts of four different professional sports teams that play in 4 out of the 5 major sports leagues in the Country. Not only this, but The A features more than 340 parks and natural reserves that are scattered throughout the city. Atlanta is extremely green and lush, especially for being a big city. It’s said that more than half of the population lives less than 10 minutes away from a green space. There are many used car dealerships in Atlanta, so you need to do your research and find the one that offers the best terms for your case. You have to look at reviews and make sure the dealership you choose is also registered and certified. Here is our take on the best dealerships in Atlanta based on online reviews. Finding a reliable loan providing in Atlanta can be extremely difficult, especially if you’re not sure where to look. At CompleteAutoLoans.com, we specialize in connecting people with low ratings to lenders who provide good terms, regardless of your score. You can learn more by reading out resources page or find your ideal lender by checking out our online application form.